We have designed Juice and ExoMars 3D models adapted to Cosmographia. Enter the software and be ready to fly along with this missions to their destiny, enjoy the spacecraft design with realistic 3D graphics, see what they see and discover the wonders of the Solar System . ExoMars is a joint endeavour between ESA and the Russian space agency, Roscosmos. The first part of the ExoMars programme, Exomars 2016, consisted of the Schiaparelli lander and the Trace Gas Orbiter (TGO), usually just called ExoMars. ExoMars’ main goal is the search for life in Mars. Since 2016, TGO is looking for evidence of methane, which could be evidence of biological activity. Unfortunately Schiaparelli’s landing went wrong and it couldn’t perform its task. 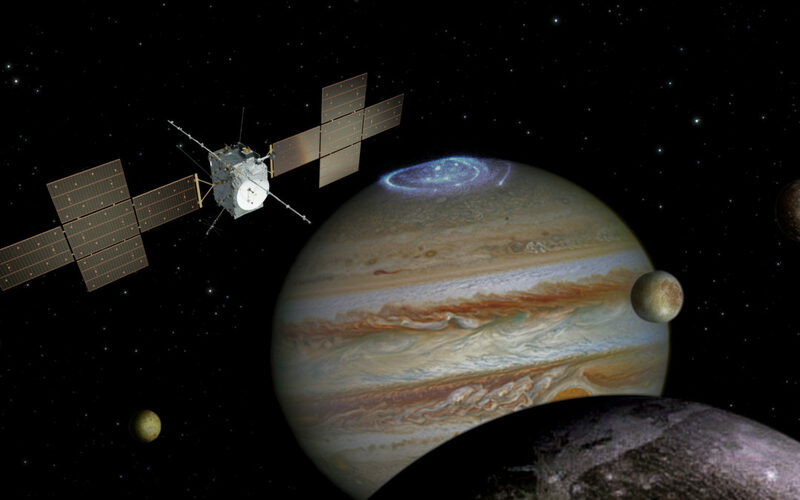 On the other hand, the Juice mission (JUpiter ICy moons Explorer) is a mission proposed by ESA for 2022 which will explore Jupiter, and its moons Europa, Ganymede and Calisto to found more about the misteries of these wonderful and potentially habitable environments. We have designed 3D models of both of this spacecrafts specifically to include them in Cosmographia. Cosmographia is a Solar System simulation software. It’s an interactive tool used to produce 3D visualizations of planet ephemerides, sizes and shapes; spacecraft trajectories and orientations; and instrument field-of-views and footprints. It does not only allow you to travel trough all the Solar System and explore its main objects with astonishing details, zooming into extremely high resolution maps. In Cosmographia you can also explore over 500,000 asteroids, watch auroras, follow the path of spacecrafts, view eclipses and enjoy many other astronomical events. Moreover NAIF (Navigation and Ancillary Information Facility) a team of the JPL (Jet Propulsion Laboratory) and Caltech (the California Institute of Technology), under contract with the U.S. National Aeronautics and Space Administration (NASA), extended Cosmographia to make it use SPICE kernels, making this software not only amateur, but a professional tool for mission planing and data analysis. Way before JUICE was implemented in Cosmographia, the ESA started using SPICE for their missions too. And now the ESAC SPICE Service is releasing catalog files for some of ESA’s past, present and future missions. Namely: Juice, ExoMars 2016, BepiColombo, Mars Express, Rosetta and Venus Express. This catalog files may be used in SPICE, buy they also may be aded to the SPICE-enhanced version of Cosmographia to explore the path of this missions in detail. Back to us, we have designed the Juice and ExoMars 3D models that are included in those files, and we are proud of having contributed with our experience to such a huge project.